Not so long ago, the harmonica was on everyone's lips. In the mid-1920s, German manufacturers exported 50 million units all over the world. In addition, hundreds of thousands of accordions have been exported. Even for the lifestyle of the 1950s harmonica sounds were quite typical. From tango, blues, musette and many other musical styles, they have become indispensable to this day. 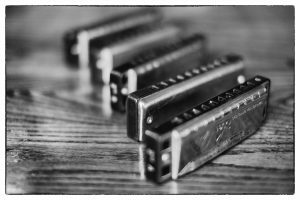 Harmonica and accordion are rightly considered to be the most popular musical instruments of the industrial age. The German Harmonica and Accordion Museum has a worldwide unique collection on this musical theme and the associated economic, social and cultural history. To be able to present the state-owned Hohner collection outside Trossingen, we have been offering the traveling exhibition "In aller Munde" since September 2000. It covers a footprint of approx. 150 m², includes various topics and can be extended as desired. Here you find the prices and conditions for hiring the traveling exhibition. (film, concerts, workshops, guided tours).